In Minecraft, slabs are half-blocks that can be found throughout the world, crafted from stone or wooden blocks, and are often used as an ingredient in other crafting recipes such as armor stands. Most players use slab materials to design their buildings, using these items most commonly as stairs. Slabs can be obtained through mining blocks with a pickaxe or even found naturally in villages, strongholds, wells, or even temples. However, the most common way to acquire stone slabs is through crafting. Learn how to make a slab in Minecraft by following these simple steps. To start, place 3 blocks of the same material in a horizontal row in your crafting grid. This will create a total of 6 slabs. These blocks have to be the same material in order for the crafting process to take effect. It’s not all about the stone! 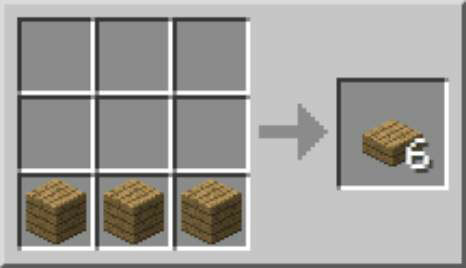 You can make wooden slabs in Minecraft only by using blocks of the same type of wood (unlike other wooden objects), and they retain the name of that wood, such as oak slab or birch slab. Follow the same crafting recipe as listed earlier, by placing three wooden blocks in a horizontal row in your crafting grid. Slabs are so useful in Minecraft construction because these entities are treated as whole blocks by other blocks and liquids. Since these half-blocks only take up ½ of a normal block space, there is an empty space between them and the adjacent blocks surrounding them. This allows the player to put things, such as redstone, underneath them without their being a big hole in their structure. Right-click on the bottom of a ceiling block and remove the ceiling block. Right-click on the top half of a block to place the slab connecting to the top of that block. Upside-down slabs have a greater damage value than those placed in the bottom position. Slabs aren’t shown as solid blocks when interacting with redstone, which allows you to place a wire above or below a slab without interruption. Interestingly, on upside-down slabs, redstone placed on top can transmit signals only going upward (not downward), and it can receive signals from 1 block below. Upside-down slabs can then be used as redstone ladders. Slabs are also highly blast resistant, allowing them to be placed below TNT to mitigate the damage or to limit the damage from exploding creepers. Many types of slabs can be crafted to form the chiseled version of that block, creating incredible visual effects. For example, 2 stone brick slabs can be crafted into a chiseled stone brick. Now that you know how to make a stone or wooden slab, use your creativity to incorporate chiseled bricks, quartz blocks, pillars, or even daylight sensors into your construction.